#WeAllGrow Storytellers 2018: Your Story of Evolution. Submissions Are Now Open! #WeAllGrow STORYTELLERS 2018 Submissions are now open! It’s so important to never give up on your dreams. We all learned that as young girls and the Disney Princesses helped encourage us to go after what we want. Tiana taught us that hard work can make your dreams come true. Belle taught us to never judge a book by its cover. Mulan taught us to dream big by taking the lead. Jasmine taught us to dream big and try new things. In anticipation of the Storytellers session, we sat down with each Storyteller to get inspired by their stories of what princess they most identify with, their Dream Big moments and more! Make sure to tweet at them to let them know how excited you are to meet them and don’t forget to include the #WeAllGrow and #DreamBigPrincess hashtags so we can see it too. Get ready to be inspired! Why did you choose the princess you did for your story? Elayna: “I never saw myself as Mulan, however, my daughters consider Mulan to be ‘my soulmate princess’ because she finds purpose in her pain, finds strength in her struggles and has the courage to fight for herself and those she loves. I was in tears when I discovered that my daughters saw me as a courageous fighter who is graceful and balanced. It was such a sweet mother-daughter moment. What has been your "Dream Big" moment? Elayna: “I had my first ‘dream big’ moment when I was 7-years-old. I lived in extreme poverty and my toys came from the city dumpster right behind the wooden shack where I lived. This particular day, I found a soggy and smelly American children’s magazine that portrayed childhood as a happy experience. I was intrigued and felt it was a vision for what my life could be: having the support, resources and time I deeply desired. When you dream big, you give yourself permission to be bold, to go beyond your circumstances and out of your comfort zone. That day I decided I had to make it happen and to decode the secret, ‘aprender ingles’ was step one. Marianna: “When I set out to raise my bilingual child, I quickly learned that one of the biggest struggles multilingual families had is that they felt completely alone on their parenting journey. Given the fact that the majority of individuals around the world speak more than one language, this lonely fact just didn't sit right with me. I searched for a solution and when I just couldn't find it, I set out to create it. I dreamt big and wondered if maybe I could be the one to give a voice to these families. Maybe I could be the one that would bring families from around the world together so that they never had to feel alone and ultimately give up on their dreams. I quickly turned my big dream into action. I stepped into a completely unknown world and researched anything and everything I could about the world of podcasting. Within a few months, I launched my own show that two years later continues to bring multilingual families from over 130 countries together to share their multilingual experiences. One of our favorite quotes is, "Be the woman you needed as a little girl." If given the chance, what would you say to your younger self? Marianna: “Like many teenage girls, I struggled with the need to ‘fit in.’ As an immigrant teenage girl, however, I had all the added pressure that comes with needing to ‘fit’ into a different culture and a different language. And what's one message you would tell a room full of little chicas? Meet The 2017 #WeAllGrow Storytellers! Please join us in congratulating the 2017 #WeAllGrow Storytellers! A special thank you to the team behind Disney Princess “Dream Big, Princess” for allowing their stories to be shared. Disney Princess “Dream Big, Princess” is the #WeAllGrow Storytellers 2017 Presenting Sponsor! Submissions Are Now Open! Disney Princess “Dream Big, Princess” is our official sponsor for #WeAllGrow Summit 2017 STORYTELLERS! Submissions are now open! When we launched #WeAllGrow Storytellers at the inaugural Summit in 2015, there was just one goal in mind: to showcase the diverse voices of our community. We honored the influencers with a mission to build community through storytelling by providing them support and a platform to elevate their voices. It was a simple intention, made from the heart, but what has transpired has surpassed even my expectations. With an increase of submissions from last year, #WeAllGrow Storytellers 2016, presented by YouTube, has evolved into an event so much bigger than our initial intention. The inaugural event set the tone for its growth, inspiring all of us in attendance and making #WeAllGrow Storytellers the cornerstone event that embraces the beauty, vulnerability and passion our storytellers are known for. Because of this, I want to thank each of you, not just for the submissions, but for your continued courage, inspiration and creativity in the online world. You make us all so proud! Choosing the finalists was not an easy task. Together with YouTube, the presenting sponsor and whose commitment allows the six finalists the opportunity to attend #WeAllGrow with an all-expenses paid experience, Kathy Cano-Murillo and representatives from Latina Bloggers Connect, six finalists were chosen to shine on a platform made for their stories this coming March in Long Beach, California. Please join me in congratulating the 2016 #WeAllGrow Storytellers and in thanking YouTube for making it possible. We cannot wait to showcase their stories of family that will make you laugh, cry and leave the Summit feeling inspired. ANNOUNCING #WEALLGROW STORYTELLERS 2016, PRESENTED BY YOUTUBE. WE’RE OPEN FOR SUBMISSIONS! One of the most memorable moments of our inaugural #WeAllGrow Summit was the Storytellers event. It was hard to find a dry eye in the room as the six fabulous, strong and vibrant Storytellers got up on stage to bare their souls in eight minutes time. They were funny, they were heartfelt, they were raw and real. #WeAllGrow Storytellers is the event where we come together as the beautiful sisterhood of women we are to honor the influencers with a mission to tell their stories and connect communities. We’re thrilled to announce that YouTube is sponsoring #WeAllGrow Summit Storytellers 2016! We felt that YouTube would be the perfect partner given their global platform provides people the opportunity to share their stories and connect, inform and inspire others across the globe. Please join us in celebrating this announcement and thanking YouTube for returning as a #WeAllGrow Summit sponsor with Storytellers. 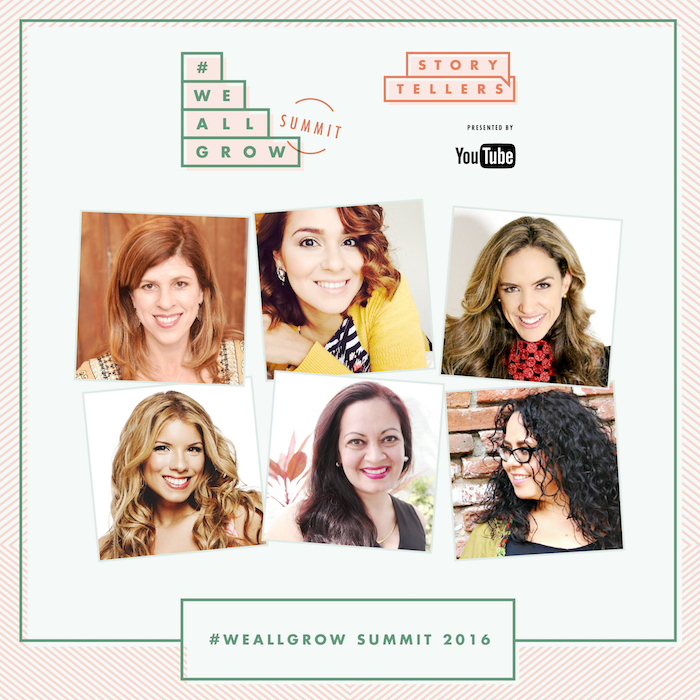 The six selected Storytellers will attend #WeAllGrow Summit courtesy of YouTube. The all-expenses-paid experience includes one conference pass, airfare and 3-nights at Hotel Maya! Not only that, but every one of the six hand-selected Storytellers will have the option to invite one blogging / creator friend to receive a conference pass and 3-nights in shared room at Hotel Maya, courtesy of YouTube to attend the conference with them! We want our Storytellers to feel supported as they share their stories, and what better way than having someone that feels like familia there with them. And, yes, Kathy Cano Murillo (aka Crafty Chica) will be back to emcee and provide guidance and training (via Skype) to the six selected Storytellers. Our 2015 Storyteller alumni can tell you just how wonderful and helpful it is to go on this journey with Kathy! YouTube will also work directly with the chosen Storytellers on tips and best practices for visual storytelling. That’s priceless, don’t you agree? We heard from so many of you that you’re eager to submit a pitch for Storytellers 2016 and now your time has come! ARE YOU READY TO BECOME A #WEALLGROW STORYTELLER? 1 to 2-minute video pitch sharing only the main arc of the story. You do not need to be a parent to apply, but the topics must be relevant to your family or childhood. Storytellers will be selected from a panel of judges including Latina Bloggers Connect, Kathy Cano-Murillo and YouTube. Main criteria is the impact of the core idea of the story based on the topics above, as well as ease and confidence sharing the story. There was so much to cover, we just felt that the #WeAllGrow Storytellers event, presented by Vive Mejor and sponsored by Dove Dry Spray Antiperspirant, that took place on the last day of the #WeAllGrow Summit needed its own post. One of the community’s most loved craft blogger and creator, Kathy Cano-Murillo, set the tone for the event with the ray of sunshine and glitter that she’s known for. She shared her own personal and hilarious accounts of raising her son in a musically and artistically inclined family, and how he used to often unknowingly through them under the bus by voicing the “wrong facts”, which essentially became his nickname. As the storytellers presented their journeys, there was much laughter and many tears from the audience who resonated with many of the roads traveled and lessons learned along the way. Astrid Rivera shared an emotional story of love and loss, and the very special connection she had with her father-in-law. His dream was to be well enough to see his son be married, and even after suffering a stroke, he promised to be there for that day. He was - not in person, but via Skype. That night, he passed away with comfort that his son was now married. The experience has taught Astrid to wake up knowing that she has dreams to achieve, goals to reach and a heart to love. Ana Cruz brought light to the discussion of domestic violence by sharing her personal experiences. Her mother and greatest source of inspiration always encouraged Ana to go to school and chase her dreams of being the radio industry. She did just that. But even after she knew how hard her mother worked and the devastation of domestic abuse, she found herself in a similar situation later in life. After becoming a mother herself, she found the strength to leave and start a new beginning for her and her son. With a lot of determination and a strong work ethic, she got her dream job as a radio host. She is now using her platforms to build communities and raise awareness about domestic violence. Carol Cain shared a journey that was just beginning of a new chapter in her life. Just a Facebook friend request away, she was reuniting with her mother after 25 years. At the age of 5, Carol was taken away from everything she knew - her mother, her home and the community she grew to love La Perla, Puerto Rico - by her father. Raised in NYC, at the age of 21, Carol went back to La Perla to visit her mother but wasn’t ready to truly embrace the complexities of the relationship. She is now. Her story is one of second chances and the power of love. Jeannette Kaplun took the audience on trip a Chile with her story about the obstacles she faced getting into her chosen college to where she is today. Despite her father’s words, who preferred she studied psychology - Es mejor ser cabeza de raton de cola de leon - she chose the path the journalism. Although hurtful at the time, his words encouraged Jeannette to push harder and become the lion’s tale. She did. Not only did she graduated top of her class, she delivered the commencement speech. Jeannette learned that if you have a dream, no matter what anyone tells you, you must work hard for it. Never settle being being the big fish in the small pond. Fast forward to today, Jeannette’s father is glad that she proved him wrong. Claudya Martinez shared her relationship with “La Miedosa” - The inner voice that tries to take over whenever she wants to try something. However, as frustrating as this voice can be sometimes, it saved her life. Her story is one of fear, strength and courage. A survivor of a dangerous encounter, Claudya inspired the audience to embrace their inner miedosas and see her as the guardian angel that is there to keep you safe. Accept her for who she is but know when to put your foot down. You are so much more than your fear. Lorraine Ladish believes in the power of women helping each other. After losing her job and working through a difficult marriage, she walked away with her two daughters. With the help of family and her jewelry box filled with heirlooms and memories, she began process of rebuilding her life. When she found herself unable to pay rent, which led to sell each gold piece one by one - A very painful decision. But it put a roof over her head for one more month. During an evening that would change her life, she met a woman who gave her two diamond rings to sell for her next month’s rent. The gesture fueled and inspired Lorraine so much, she has since been paying it forward through her work as an author and online community, Viva Fifty. Thank you to our sponsors and all the extraordinary people who joined us for the inaugural #WeAllGrow Summit. We’ve already picked out the new location for next year, and we cannot wait to share the details! Until 2016! Watch all the Storytellers' videos on the Latina Bloggers Connect YouTube channel. We know this community is passionate. We know you're eager to tell your stories and embrace a path to growth. And yet, we never expected all that to amount into the overwhelming response and eagerness we received from you at the announcement of #WeAllGrow Storytellers, brought to you by Vive Mejor, and Dove Dry Spray's commitment to fully sponsor the six selected Storytellers and their blogger besties to attend the conference with an all-expenses paid experience. Dove Dry Spray Antiperspirant is an innovative new product that women just can’t keep to themselves and want to share with their friends. And share is what sixty-one of you amazing mujeres did! Sixty-one pitches from Storytellers is what we received. Sixty-one heartfelt, gut-wrenching, soul-revealing, funny, endearing submissions from Latina influencers all over the country. As tough as it was, a panel comprised of Kathy Cano-Murillo, Dove Dry Spray, Vive Mejor and Latina Bloggers Connect have selected the six finalists who will shine on the Vive Mejor #WeAllGrow Storytellers stage on Saturday, February 27. Join us in congratulating them as our inaugural group of #WeAllGrow Storytellers and in thanking Dove Dry Spray and ViveMejor.com, the one-stop destination for Latinas for expert beauty advice, quick and delicious recipes and more, for making it possible. #WeAllGrow Storytellers, Presented by Vive Mejor, Open for Submissions! At #WeAllGrow, we honor the influencers with a mission to tell their stories and connect communities. As content creators, we know that part of living una vida mejor is telling the stories that are fundamental to our lives with the community that we've built. It feeds the soul and captures our purpose for creating an online presence. Do you consider yourself a storyteller? We hope you do and want to encourage your growth! To celebrate the art of storytelling, we’re excited for the inaugural launch of #WeAllGrow Storytellers, presented by Vive Mejor, an engaging session that aims to celebrate the best storytellers amongst us while providing them with a platform to elevate their voice. And because we value your voices, selected #WeAllGrow Storytellers will be fully sponsored by new Dove Dry Spray Antiperspirant to attend the conference with an all-expenses paid experience! Dove Dry Spray Antiperspirant is an innovative new product that women just can’t keep to themselves and want to share with their friends. That’s right amigas, every one of the six #WeAllGrow Storytellers that will be hand-selected can also invite one blogging friend to be fully sponsored by Dove Dry Spray to attend the conference with them! We want our Storytellers to feel supported as they share their stories, and what better way than having a dependable, caring and trustworthy friend in attendance. New Dove Dry Spray wants to celebrate that spirit of sharing by partnering with Vive Mejor and #WeAllGrow to bring us Storytellers, bound to be one of the main highlights of the conference. Pero, we know it’s not easy; standing in front of a crowded room can be a daunting – if not exhilarating - and sweat-inducing task. So why not ask your most-beloved and supportive blogging friend to come along and cheer you on? #WeAllGrow Storytellers will evoke emotions that follow life's reoccurring threads: hope, struggle, inspiration and more. #WeAllGrow Storytellers, presented by Vive Mejor, will be hosted by Kathy Cano-Murillo of Crafty Chica, a master storyteller of glittery proportions, and Storytelling Advisor. Kathy is a veteran blogger, author with nationally distributed craft products and is recognized for her ability to convey messages of love, hope and friendship. Thanks to Kathy's mentorship (via Skype) and Dove Dry Spray's sponsorship of the six Storytellers and their blogger bestie, our #WeAllGrow Storytellers will be ready to present conference attendees with an experience they won’t soon forget. We’re thankful to Vive Mejor and the new Dove Dry Spray for making #WeAllGrow’s vision for Storytellers a reality. New Dove Dry Spray Antiperspirant goes on instantly dry (for a cleaner feel) and leaves underarms soft and smooth. It also offers the brand’s signature ¼ moisturizers to provide all the care of Dove in a surprising new Dry Spray, leaving underarms feeling soft and smooth while providing 48-hour odor and wetness protection. ViveMejor.com serves as the one-stop destination for Latinas for expert beauty advice, quick and delicious recipes and more - everything needed to live fabulously better. Check out their enhanced recipes, cooking tips, and up-to-date beauty and lifestyle solutions from trusted brands by visiting them at www.vivemejor.com, on Facebook, Twitter and YouTube. 1 to 2-minute video or audio pitch sharing the main arc of the story.